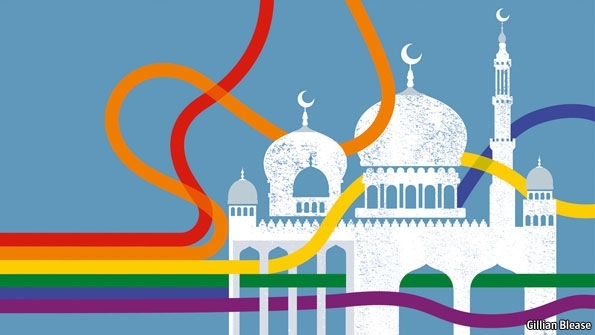 Having observed both Islam and homosexuality in great detail for over forty years, I am constantly reminded of their similar infrastructures and propaganda techniques. Really, this should not be surprising because both are neo-socialist. Islam has always had its methods of making people comply, but since the rise of ISIS Islam has copied homosexual activism remarkably. One of the most obvious copies is the word ‘Islamophobia’, following the obvious other label, ‘Homophobia’. When ‘Homophobia’ was first thrown out, it meant ‘fear of homosexuals’. (Its etymology does not mean that, but extremists don’t care about accuracy). But, when this definition didn’t work, the meaning was changed to ‘hatred of homosexuals’, which took it even farther away from its etymology! But, the media was sucked in to accept it, followed by academia and governments, though its bizarre change was so glaring. Both the word and the definitions were invented, then simply changed at will. They are not real, but are meaningless. But, after a while of being pounded daily by the word and its definition, the world slowly accepted both ‘phobias’ as genuine, even though there was, and still is, no real evidence that anyone hates homosexuals or Muslims (except when Muslims are terrorists)! Words are part of propaganda. Socialists of every hue, communist and fascist, have used words to make an impact on the general population. Words are changed in type and meaning, so that true meanings become lost (see A/523, ‘How Gay Propaganda Twists Truth’, by request from our website). Even the word ‘gay’ has been totally turned around so that its original use is obscured. In the 1960s homosexuals preferred to use ‘gay’ because of its mental image of happy and carefree. The fact that ‘gay’ is far from carefree and happy is carefully erased from reports, stories, and even films, which all depict this inglorious lifestyle as always wonderful and loving, when it is the exact opposite. This change of words and meanings is deliberate and cold-hearted. They are used to change society’s attitude and, eventually society itself, without society realizing what is going on. Because of my age, I was able to personally observe this remaking of history. And the changes have been phenomenal but unworthy. With each word change came societal deterioration. Even so, you can batter someone’s brain until they accept what you say… but after a while they become immune to the changes and finally see they have been taken for a ride. Then comes the resurgence of hope, truth and rebellion. This is because the real words and their meanings do not resonate in the mind. People know instinctively that something is wrong. Eventually, what was once hailed as the best is seen to be the worst, and society starts to reject what has been forced down their throats. Islamists (those who are fanatically Muslim) have used the same tactics as homosexuals, firstly by using the word ‘Islamophobia’. Homosexuals used ‘homophobia’ to convince governments they needed special protection. From there came laws to ‘protect’ them, and then laws, still in progress, to punish those who do not accept the homosexual mindset. At every stage, there was no true evidence that they needed protection at all; so they also invented false examples of a ‘need’ to be protected specially. But, they lied and continue to lie. The latest example is the mass shooting in Orlando, which was blamed on ‘homophobia’. In reality it was an act of Islamic terrorism! Similarly, Islamists are trying to make society believe Muslims are being persecuted by white people/the West. But, it is all an invention, as with homosexuality. Homosexuals like to complain about being attacked in the streets for their sexual choice, but these are usually false. The same goes for Islamists – with many Muslims setting fire to mosques to convince the police they need protecting! It is ironic and almost amusing that Islamists are following the same propaganda path taken by the homosexuals they claim to hate, and using their methods. Another way Islamists twist words and meanings is in their usual anti-West diatribes. While liberals and leftists instantly apologize to Islam for all the (invented) things the West is supposedly guilty of, the same Westerners don’t bother to check the facts! (On my website you will find three major articles about this systemic form of lying by jihadists, which is also used by Obama). What of the word ‘Islam’? Muslims in the West are very happy to let western leaders repeat that ‘Islam means peace’, when, in fact, it means ‘submission’. However, many Islamic leaders in Islamic countries are outraged by this, and repeatedly say Islam is nothing to do with ‘peace’ but with forcing others into submission! But the twee Western leaders insist on spreading their own meanings, thus deceiving the public. Take, too, the word ‘peace’ itself. Muslims deliberately avoid advising us in the West that in Islamic terms ‘peace’ is not what Westerners take it to mean. In Islam, ‘peace’ refers to a time when all the world is taken over by Islamic control. And when they say a town they occupy is now the most peaceful place on earth (they said this about Mosul), they do not actually explain what they mean. That is, the town is at peace in the Islamic sense – the people obey Allah and imams and terrorists, rather than have their heads cut off. Thus, the ‘peace’ is a state of being so afraid that you keep your head down (literally) and do whatever the occupiers tell you to do. So, when Islamists tell you something, check out the actual meaning of their words, because (a) they lie and (b) meanings are not Western. Because of this word-change and substitute word meanings, Western leaders are played like violins! Or, rather, played for what they are – fools who become tools of Islamic propaganda without knowing it. (Obama is different, because he is Muslim and knows what Islamic words mean). I can’t wait for this to happen with homosexuality and Islam, but there are many other candidates for this makeover from lies to truth. Never lose your critical faculty! It is your only defense against propaganda. Gun Safety Matters More than You ThinkIs Donald Trump Getting His Groove Back?